Boat owners doing their bit for the ocean as they travel it is wonderful for supporting diversity. Most of the people who visit Irukandji share something in common; a love of the ocean. Many different walks of life share the love for the infinite blue and if you love something there is a small level of reasonability to ensure it gets treated right. Most boat owners share this passion, yet they may be surprised to learn they are directly harming the ocean just by mooring their boat. The conventional block and chain mooring does damage to the sea floor directly surrounding the boat by dragging backwards and forwards with the tide, ripping seagrass out by the roots and removing any life that is present. It may not seem like much-directly under your boat, however when you take into account all of the moorings all around the world the mass of seafloor transforming into a dessert is vast. The next step is to spread awareness of the environmental moorings in the hope people will care about the big blue and replace their current mooring. 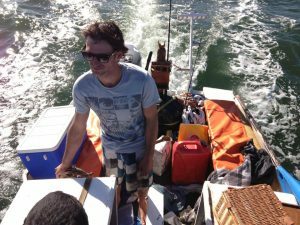 Irukandji believes this is an amazing initiative and wants to jump on the band wagon to get the awareness out, you can view this video in our “Share” section be sure to share it or tell all the boat owners you know.